Smart AI – For a game that’s made on a shoestring budget the AI in Avatar Karting is fantastic. Opponents will drive aggressively, often pushing you out of their way to gain the advantage. They’re also smart enough to recover quickly should you actually succeed in returning the favor. They’re relentless, pushing players to focus on being a strong racer rather than trying to bully past the AI to win. Believable physics – Firing the game up we assumed that the physics would be poor, not even accounting for multiple surface types. We were wrong. Tarmac, grass, gravel and dirt all feel different, and the karts behave in a believable, if not arcade-like, manner. Drifting through the corner instead of sticking to it really adds some needed punch to the game, and the turbo feature gives that extra boost to catch the AI. A lot in a small package – For 80MSP players are rewarded with their choice of kart color and nationality flag, 16 tracks, a grand prix, time trails, plus splitscreen and online multiplayer. Leaderboards also exist as well, though at the time of this review they were not functioning. Could have easily been more – Yes, 80MSP is a steal, but Avatar Karting could have easily demanded 240MSP with additional features. The tracks have no change in elevation, and so some can get boring quickly. Spending some time adding elevation would have increased the game’s value. This also seemed like the perfect platform for a Mario Kart-esque gametype. Adding powerups and weaponry in a separate mode would draw a substantial amount of additional buyers. The game could retain its standard racing gametype, but the addition of a second, weapon-based mode would be the one thing XBLIG needs but doesn’t have. 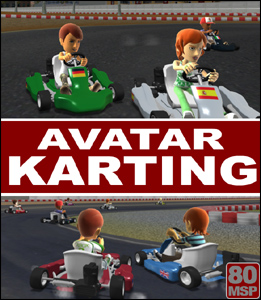 Though Avatar Karting isn’t for everyone, we can’t deny the sheer value that the game displays. 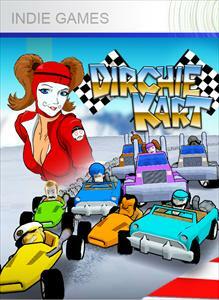 It’s clearly geared towards casual players, perhaps even those with children who they can race alongside of. 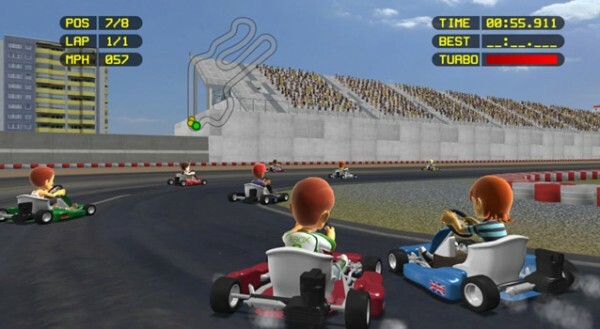 It’s a game filled to the brim with features for its 80MSP price, but the letdown is that it could have easily been sold for 240MSP with additional features borrowed from other karting games. Still, for the cost it’s a steal.